Lake Titicaca is like a small ocean. Standing on the docks of Puno at eight o’clock in the morning, the lake stretches out before you like a sea of polished glass, smiling up at the sky. From our early morning vantage point on the docks, we could not see the far side of the lake. Lake Titicaca straddles the border in between Peru and Bolivia, and it was so enormous that the Bolivian banks were completely lost to the horizon. We clambered into the boat and set out across the lake. Everywhere you looked was blistering blue – from the cloudless sky to the smooth lake – and the wind stung at our cheeks, still carrying the last bitter edge of winter. We must have spent all day on that lake, and not once did I see the Bolivian shoreline; it was hidden in the gap between the sky and the water. Our first stop on the lake was one of the floating islands. 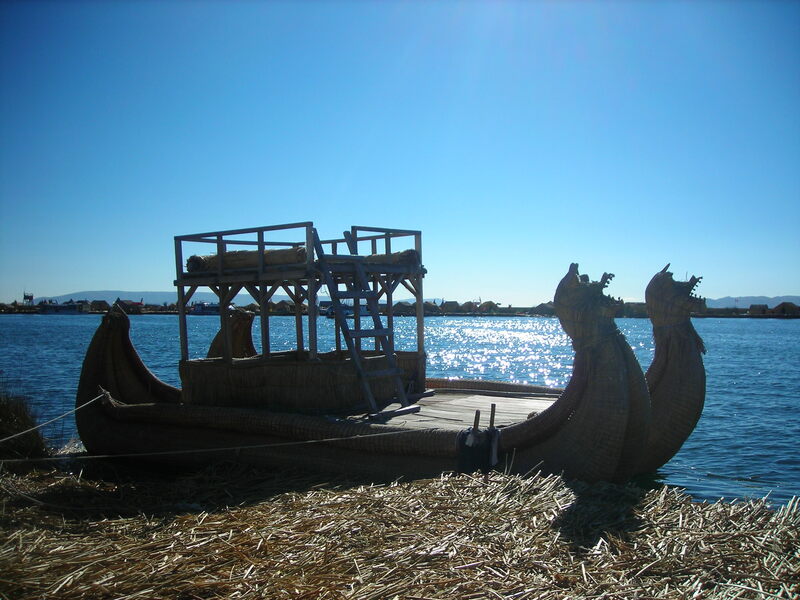 For those of you who don’t know, Lake Titicaca is home to a whole host of reed islands, most of them man-made and all of them supporting a small population of people who make their living from the lake. Everything on these islands is made entirely of reeds – even the slightly unsteady ground beneath our feet – in accordance with the people’s traditions. Some of the islands welcomed us nosy tourists, others were hidden away from us, choosing to maintain their traditional way of life and keep the tourists out. Exploring the reed islands was a bizarre experience. The reeds which build their homes also make up the staple of the people’s diet, which they insisted we try. The island reeds tasted like watery celery, and as we ate – and as we saw that the reeds had also been used to make houses, boats and benches – I came to realise just how versatile one small plant can be. They invited us into their houses and rowed us across the lake on their boats, all of which were made of the same reeds which we had been eating a few minutes before. Needless to say, it was a very strange experience. Then we climbed back into the tour boat and set out across the lake again. We were heading for the island of Taquile, a small island on the Peruvian side of the lake where we would have our lunch. It was absolutely beautiful. We climbed up a small hill littered with large, grey boulders to reach the main town on the island, and as we climbed we saw clusters of small, bright flowers and clear, smooth rocks sitting at the bottom of the lake. Once we reached the town we climbed to the top of the bell tower and stared out across the lake, the edges still shrouded in a distant mist while the sun beat down upon our heads. For lunch we ate quinoa soup and fish, caught fresh from the lake only that morning, with the lake glittering in front of us. It was one of the most beautiful places that I have ever seen, and I was very sorry to leave it behind.